After our preview of the upcoming PC game Sengoku from a few weeks back, we thought it would be interesting to bring an interview with the creators of the game to Shogun-ki readers. 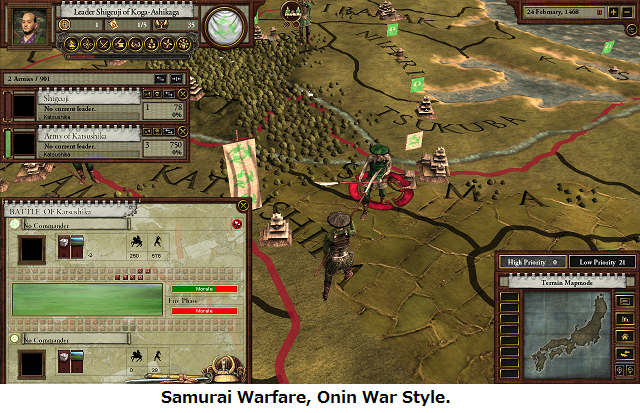 Heavy on the politics, scheming, and complex alliances that the era was noted for, this innovative game also saw rough Sengoku justice delivered by Paradox staffers upon each other during multiplayer games. We’re assuming the good natured battles left enough staffers alive to complete the game on time for its September 13th release, and that their heads aren’t decorating the Rokujo riverbed in Kyoto. In the following interview, CK is game designer Chris King, NS is historical researcher Niklas Strid, and SA is the SA’s Tatsunoshi (Randy Schadel). We first talked with Chris King. SA: Can you give us a little background on your primary development/design team? Who are they and what are their responsibilities? Have they worked as a team on any other projects? CK: The core design team was myself (Chris King, the lead designer), Johan Andersson (head of development), and Thomas Johansson (project lead). We worked together on Hearts of Iron 3 and Victoria 2. This is the core team, but after that it was everyone in the team, even those on other projects who all contributed toward the game. SA: With "Total War: Shogun 2" having been released earlier in the year, there will no doubt be the inevitable comparisons made between it and Sengoku. What about Sengoku will make it an entirely different and fresh game experience for players? CK: As a general rule when it comes to making a game you create a core focus of the game and stick to it. Everything you add beyond that is to enhance that core experience. The Total War games are firmly focused on the tactical battles, and most players agree they do them very well. When we began to look at development of Sengoku we knew that our strength is something else than what the Total War games offer. We felt we were good at higher level strategy games and we focused away from combat onto the greater strategic interaction, trying to focus in on the interaction between the characters. SA: Can you give us a general outline of the different steps taken in the development of Sengoku? What all did it go through between the initial concept and the final release? CK: The first thing we think about when designing a new game is: can we make it fun and would we want to play this game? The answer has to be yes, because if we wouldn’t want to play this game then who will? ;) After that you move onto the practicalities of can you actually produce your concept. Once those two hurdles are cleared all you have to do is make the game. SA: The Clausewitz Engine (used by Europa Universalis III and Victoria II, among others) along with facets of the upcoming Crusader Kings II were used to build Sengoku. What was behind the decision to use these-what makes them appropriate for Japan's Age of Warring States? CK: Crusader Kings II is really the key one, Europe during the Crusader Kings II time period shares two key similarities with the Warring States period. The political structure is feudal and the personalities, and their relationships with each other, drove the time period. Starting with that foundation you can a graft onto this foundation a uniquely Japanese experience. SA: Based on a preview edition of the game, Sengoku does an excellent job of replicating the precarious situation most clan leaders of the time (15th-16th century Japan) found themselves in, no matter how powerful-they were all sitting on a house of cards that their retainers could easily knock out from under them. 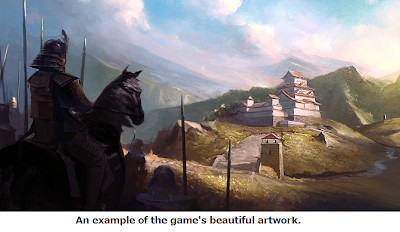 Many different factors (such as limiting the number of provinces a player can directly control, tying vassals to construction, or giving a boost to a character's stats based on the abilities of his wife and concubines) subtly work together to underline the importance of having trustworthy and capable vassals. Mastering character interaction is as vital to a winning effort as raising and deploying your armies. What are some tips and suggestions you have for players when they first sit down to play the game? CK: Vassals ability to backstab you is limited by two key factors. Most importantly is your own personal honour. If you keep your honour high enough your vassals have to remain loyal. The second is their relative power. Only when a vassal becomes powerful enough in relation to your clan are all restrictions lifted off them. So watch your own honour and try to avoid having your subordinates get too powerful. SA: Players can choose to play as a lowly kokujin trying to impress his lord-or as the powerful head of a clan trying to please his retainers, keep the clan united, and wage war (or even be a daimyo, which has elements of both). These make for totally different gaming experiences (and excellent replay value). How many unique characters will players be able to choose from at the beginning of the game-and how much of a chance do those poor kokujin have of clawing their way to the top and claiming the title of Shogun? CK: We haven’t done a count, but we estimate there are at least 200 unique kokujin in the game at the start. Now to be frank clawing your way from one province to Shogun isn’t easy, but we know that players will want to do this so we have made sure there is a route. Your first job is to become head of a clan. There are two ways to do this. If you are a family member of the clan you are in you can be elected leader of the clan by the vassals of the clan. So you need to convince the other clan members to like you, once you are at the top all you have to do is stay there. Second route is to form your own clan. If you gain enough power, or if your clan is weakened enough you can strike out on your own. From there it is game on. SA: Why was the traditional Japanese 'Shinto-Buddhist' religious base split into two different factions (and allowing players to only follow one or the other)? CK: It was because of the power the various warrior monk orders had in Japan. They were already a political force in the Ashikaga Shogunate and continued to be a force all through the Senguko period. So we felt it would be good to split them in two because of this. SA: Paradox has a strong international player base. Was this the driving force behind the decision to not use too many Japanese terms in game? CK: Japanese terms add a certain amount of immersion to a game. However, if you add too many you start to confuse things for people. So we tried to strike a balance between immersing players in Japan without demanding they have a Masters Degree in Japanese language, history and culture. SA: Was there anything left out of the game due to time and budget constraints that you would have liked to have seen included? CK: There is so much we could have added but felt constrained not to. Still if I were to pick one I would have loved to have added more interesting things to happen with the three religions. SA: What we've viewed of the artwork (both on the loading screens and the box art) looks excellent. Who are the talented individuals who produced these gems? CK: Our art team of Fredrik, Jonas and Niklas were behind the graphic look of the game. The worked hard to try and get the graphics in the game looking functional and good while at the same time trying to capture a feeling of Japan. The artist who drew the loading screens was Niklas. The cover art is created by a very talented freelancer named Viktor Titov. SA: While testing the game, which of your team proved to be the best at thrashing his opponents-or at least THOUGHT they were? Any plans for members of the team to take part in online multiplayer campaigns? CK: I have to say the current award goes to Darkrenown who decided to go and destroy Podcat in one of our office multiplayer games. Darkrenown justified this because he felt that Podcat should be spending more time patching Hearts of Iron 3. SA: The staff of Paradox not only develops the games but also plays and supports them once they're released. This takes the form of answering questions from gamers on the Paradox Interactive forums, releasing patches to enhance and expand gameplay, and incorporating suggestions from players in future releases. Does being actively involved with the people who actually play the games help with designing future efforts? Do players ever come up with tactics and strategies that surprise you and weren't factored in while designing a game? CK: Players always surprise us; it is one of those unwritten rules of game design! So for me it is not a question of what, but when. The nice thing about the forum is we get to know not just what people are doing, but also the details of why it works. This is the key to improving the game in the future and that´s why we really appreciate our active forum and our gamers feedback. SA: Paradox games are known for being extremely friendly to modding. While no one can predict where the player base might take Sengoku, what do you see as some of the more likely targets for modders to tinker with? SA: What's on the horizon for the team after Sengoku is wrapped up? If the game does well, can we look forward to expansions or similar games on other eras of Japanese history? Any dream projects you'd like to see made reality? CK: If we were to come back to Japan after a successful Sengoku I would love to do an expansion on the game. There are so many areas we felt we should pass over due to time constraints that we could spend an age adding more depth to this era. The invasion of Korea is one such example. But that all depends on if gamers enjoy Sengoku and if they will want more after the game release. Time will tell. The SA was also fortunate enough to have a talk with Niklas Strid. Niklas is an Associate Developer at Paradox and the Researcher and Scripter on Sengoku. He has two BA’s in Screenwriting as well as a degree in game design. 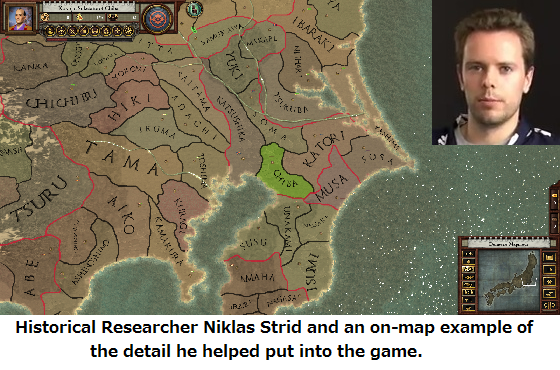 His first project for Paradox was working on Divine Wind, helping to flesh out Manchuria and Korea in the Europa Universalis game series. 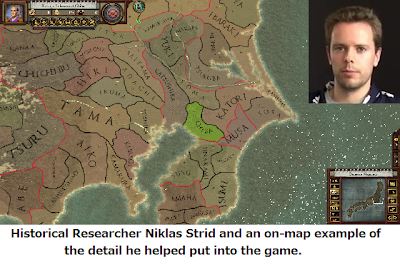 Aside from Sengoku, he’s currently involved with Crusader Kings II. SA: Tracking down information on all the 'clans', their leaders, and their holdings at the beginning of the Onin War had to have been a lengthy and involved process, but Sengoku appears to have pulled it off nicely. What were some of your primary sources used to do research for the game? NS: After browsing the Internet for whatever little information in English I could find there I tried the book stores and local libraries but it was hard to find books on Japan in general and anything before 1900 in particular (in comparison there where usually 10-15 times the number of books on China or Korea). But at the Royal Library in Stockholm I tracked down Paul Varley's book The Onin War from 1967 which turned out to be a lifesaver, and gave me a good general understanding of the conflict and the political climate, as well as a number of important characters and details about some of the succession conflicts that rage when the game starts. The great difficulty with this game was of course that most sources only were available in Japanese and many of them not obtainable on the Internet, so I set out to recruit some additional researchers that could help me out and found a small group of dedicated and very knowledgeable members on our own forum. So even though I'm rather proud of my work when it comes to the historical setup and feel of the game, I would not have been able to achieve it without their invaluable help. SA: In any historical game, there's a trade-off between playability and accuracy. In your opinion, what was the biggest compromise made in the game between the two? 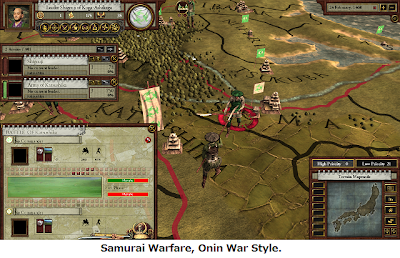 NS: Personally I think the Onin War and its repercussions were the hardest one to represent in a grand strategy game like this. Even though we have a rather accurate setup of which clans were involved and who was fighting who, we couldn't really represent the fact that the conflict was so centered around the capital, and only later spread out into the provinces. So we have a somewhat larger conflict when the game starts as the involved clans will fight each other over a much larger area. But considering how much accuracy we have managed to squeeze in, I feel that this point is a rather small one. The close-quarter street-fighting just didn't fit into this game. SA: On the other hand, what were some historical facets you were happy to see make it (or NOT make it) into Sengoku? NS: I'm happy that we ended up with a much more detailed and accurate setup than what was initially planned for when it comes to things like the map, clans, crests, characters, and the Onin War. And also the inclusion of some important historical events like the arrival of Europeans and the introduction of firearms and the way in which they are spread throughout Japan. SA: At game's start, about how many of the charcacters in the game are taken straight from history? Will players see new clans emerge into prominence later in the game like the Go-Hojo, Saito, Tokugawa, Maeda, or Hashiba? NS: Most if not all of the landed characters are taken from history and given traits and stats that reflect their historical counterparts. All in all I think we have somewhere around 400 scripted characters. Many of clans that later became famous are present as small vassal clans at the start of the game, and if they can survive an early onslaught and play it smart they might end up as large independent clans at one point. New clans can also be formed, and these draw their names from other historical clans that aren't represented at the start of the game. SA: Why were armies split into 'retinues' (forces whch are directly attached to a lord and comprise his personal army) and 'levies' (provincial forces)? NS: Splitting armies into levies and retinues where done to try and represent the shift in army size that happened during this period, where you at the game's start have access to some levy troops boosted by a small retinue, whereas later these levies will largely play a secondary role as you rely more and more on a large and professional retinue. Many of the clans that get conquered will also turn into wandering retinue bands that you can hire, and as more and more of Japan is solidified under a few clans, more and more of these ronin-for-hire will turn up, making it possible for you to put together armies of the size that the Toyotomi and Tokugawa later commanded. SA: One of Sengoku's most important game mechanics is that of 'honor'. Rather than equating honor with the later idealized and largely fictional Edo period concept of Bushido, the game instead sees it more as 'being seen to do the right thing enough to where you can get away with being underhanded'. Honor in the game can even be purchased with money. What are some of the things players can do to build up honor and what can they do that will deplete it?" NS: Honor can be gained in a number of ways from handing out provinces - or kori - that you conquer, to granting some of your vassals the daimyo titles that come under your clan's influence, to sponsoring the Emperor's court. Honor can also be gained from following a religious faction or establishing certain buildings. The SA would like to thank Chris and Niklas for their time and expertise. 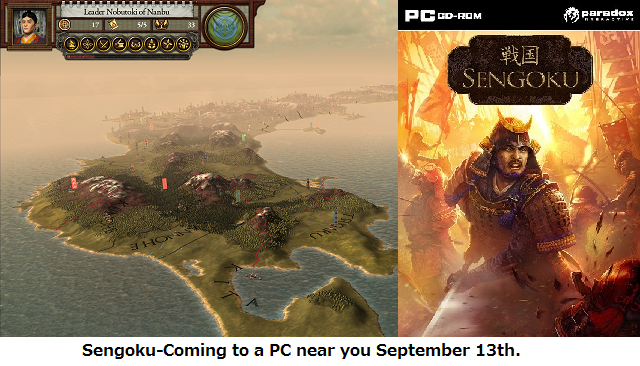 Sengoku will be available September 13th for direct download on Gamersgate (along with other venues), and a retail box version can be picked up at Amazon UK. Don’t forget to keep checking the SA for details on the ”Paradox/Samurai Archives Sengoku: Onin War Trivia Contest” to win a downloadable copy of the finished game. Until then, you can always check out the SA’s Sengoku page for the latest news along with Sengoku related links. And watch out for Darkrenown.